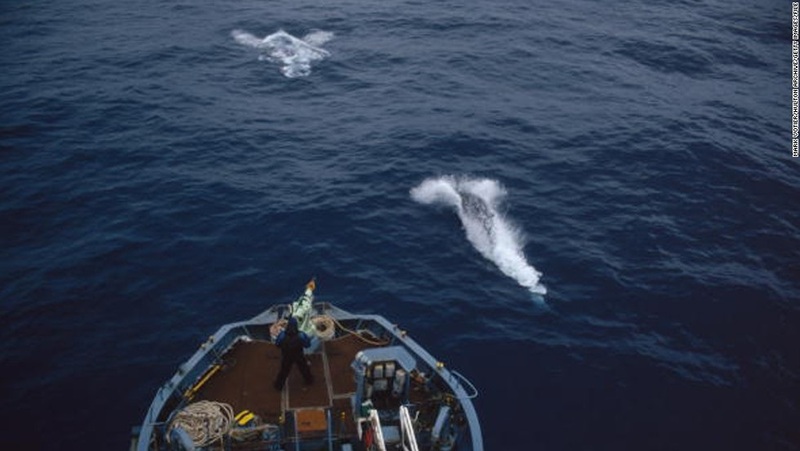 Japan has just returned from a 3-month whale-hunting “expedition” in the Antarctic, killing 333 minke whales – some 230 were females, 90% of them pregnant – as part of its pseudo-science research program to justify the whale killings. Whale-hunting is conducted by Norway, Iceland, and Japan – and, surprise, hunting pilot whales in the Danish-owned Faroe Islands is conducted, even though Denmark bans whalehunting. See the full CNN story and video on Japan. The whale meat is sold to supermarkets or basically given away — not much science here! From the IWC: “ It is well documented that IWC member governments have been unable to reach agreement on special permit whaling. In 2010, the Government of Australia (with New Zealand intervening) brought a case against the Government of Japan at the International Court of Justice regarding Japan’s Special Permit program in the Antarctic (known as JARPA II). In March 2014 the court delivered its Judgment. You can read the Judgment and related papers here. But the Japanese Have Resumed Their Whaling Activities! Men in wetsuits waded out to snare pilot whales and bring them ashore for killing. 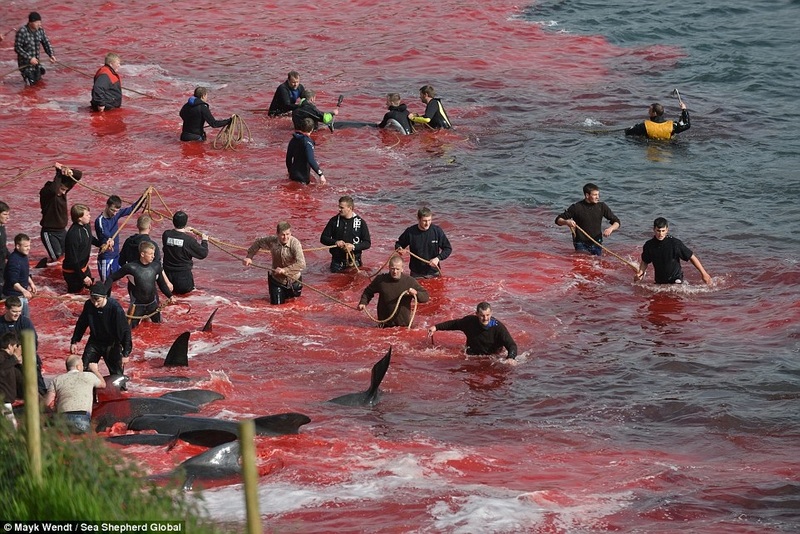 Scene of the slaughter is the Faroe Islands, part of Denmark. Copyright Mark Wendt/Sea Shepherd Global. Then we turn to the “happiest” nation on earth, according to a recent study — Denmark. Locals on the Faroe Islands — which are considered part of Denmark — plunged into the waters at Bøur and Tórshavn beaches in July 24 2015 to slaughter up to 250 pilot whales by stranding them close to shore and then attacking them with knives and blades. According to a Daily Mail report, “locals dressed in wetsuits wade into the water to kill the stranded whales… using spinal lances to stab them in the neck and back. the annual hunt, known as the grindadráp. The article, photos and a grisly video all available on the Daily Mail web site. The International Foundation for Animal Welfare notes that Norway and Iceland continue to hunt minke whales despite the ban. IFAW instituted a campaign in Iceland to promote whale tourism, rather than whale slaughtering for consumption. Learn about the Meet Us Don’t Eat Us” campaign. Make your views known with this petition to the European Parliament President Martin Schultz, to withhold voting on a new trade agreement with Japan until the Japanese promise to stop hunting minke whales. Sign the petition. From Sea Shepherd Australia’s news portal: “Once again false promises from the Australian and New Zealand governments have resulted in whales being killed illegally in the Australian Whale Sanctuary,” said Sea Shepherd Australia Managing Director, Jeff Hansen. “The majority of Australians wanted the Australian government to send a vessel to oppose the slaughter. They did not. Sea Shepherd requested that the Australian government release the location of the whalers. They refused. Instead, the governments responsible for protecting these magnificent creatures stood by, in the complete knowledge that both federal and international crimes were taking place. This empty response from authorities in the wake of the ICJ ruling is a disgrace,” he said. It’s time for Japan, Norway, Iceland, and Denmark to STOP WHALING.